Trust a dynamic, youth-focused organisation like KartSport New Zealand to shake things up on the sporting front. 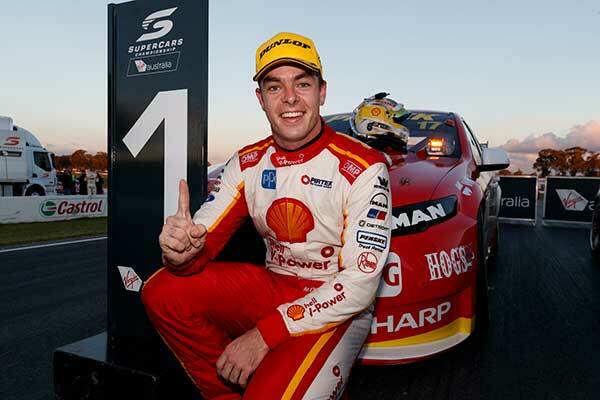 In a move which has been applauded by members young and old its new Patron is 24-year-old Supercars ace Scott McLaughlin. Traditionally the role of Patron – defined as ‘a person chosen, named or honoured as a special guardian, protector or supporter’ – has been offered to Senior members of the KartSport fraternity. This time the KartSport NZ Executive decided to do things differently. “It was time to break the mould,” says KartSport New Zealand President Graeme Moore. “Like other, similar, sporting organisations we have our traditions and one of those was that the role of Patron was largely ceremonial. “We’ve had some fantastic Patrons over the years, but we felt that, as an organisation tasked with managing an activity where the majority of active members are under the age of 20, the opportunity existed to redefine the role to one where the incumbent was younger, and more hero and inspiration than ‘father figure’. Because all of New Zealand’s current crop of world-leading drivers either got their start (the likes of Brendon Hartley, Earl Bamber, Scott Dixon, Fabian Coulthard and Scott McLaughlin) or honed their skills (Shane Van Gisbergen and Richie Stanaway) in karts here in New Zealand, the KartSport New Zealand Executive wasn’t short of potential candidates. But when enquiries were made, one name in particular kept coming up, Scott McLaughlin. Born in Christchurch, and getting his start on four wheels in karts in Hamilton, the now 24-year-old won his first major title – the 2002 North Island Cadet class one – at the age of seven and went on to represent New Zealand at the annual Rotax Max Challenge series Grand Final in Italy in 2008. 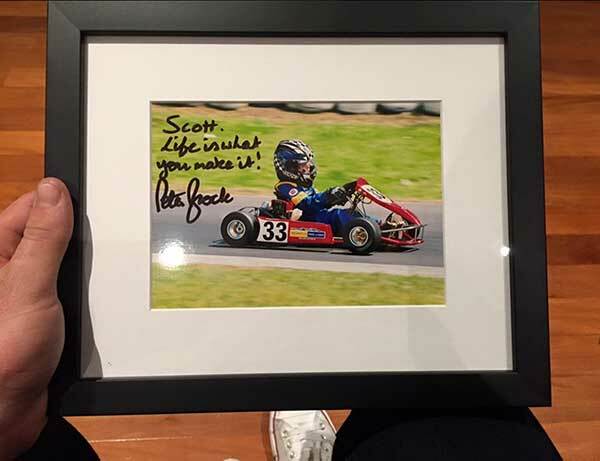 Scott with a very special keepsake from his time karting in New Zealand, a photo of himself aged seven, signed by the late, great Australian touring car star Peter Brock (pic – McLaughlin family). By that stage he was very much set on a career in cars, but continued racing karts – as he does when he has the time today – when he moved with his family to Australia in 2009. There he got his V8 Supercars break – at the tender age of 16 – courtesy fellow Kiwis, Ross and Jimmy Stone, proving immediately competitive in the Fujitsu V8 Supercars feeder series in 2011 and going on to win the title in 2012. Since then he has driven – literally – to the top of the Virgin Australia Supercars Championship, finishing third in a Volvo in 2016 and taking the lead of the 2017 series at the recent Townsville round. For his part McLaughlin says he was honoured when he was approached with the offer and that accepting it is the perfect way to ‘give something back’ to the branch of the sport that gave him his start and which he still – when time and commitments allow – enjoys a hands-on involvement in. “First of all,” he said this week.” I’d like to thank KartSport New Zealand for the opportunity and I hope that, in some small way, I can help champion both the sport and the people in it that gave me so much enjoyment and satisfaction as a youngster.